Overuse of material has a triple penalty: the excessive material cost, the excessive production process cost, and the excessive ecological footprint. This is why you have to be very careful with over-engineering. Good engineering is an accurate engineering – it reaches the sweet point between under-engineering and over-engineering. Smart design, CAD analysis and performance tests are aligned to reach the expected quality with minimal material cost. A wise Design-For-Manufacturing (DFM) process can reduce costs dramatically. My main tip in this matter is: get your manufacturers involved in the design process as early as possible - before it is too late or too expensive to take their advice and make design changes. For some products (mainly ones with manual assemblies, testing, packaging, or other processes), labor cost can be a major part of the total cost. Don’t overlook it. The labor time should be defined and calculated as part of the product design process, and the design should aim to minimize it. In some industries, the product’s logistics costs could be a significant part of its total cost. The product’s size, weight, shipment, storage, parts variety, and more could be a barrier to success. Make sure to consider all these aspects during the R&D process. Procurement might seem to be solely a commercial element. Well, in most cases that’s the way it is – the person in charge of purchasing is involved much too late and, therefore, has no impact on the design. If you only knew in advance you could have made some minor design changes and enabled him to buy alternative parts at the same quality for lower prices. Make sure to involve your purchaser early in the product design process. In certain industries, maintenance costs a lot. The product designer can reduce this cost in two ways. 1. A more reliable design – one that requires less maintenance. 2. Maintenance friendly design – one that is easier and faster to maintain. Most products have some side-products – tools, accessories, spare parts, packaging, user manuals, etc. These product costs are part of the main product total cost. Don’t disregard these products. Some of them are a direct derivative of the main part design and, therefore, should be integrated as part of the (main) product design process. Production quantities have a major impact on efficiency and costs. Designing a product without considering the expected production quantities might reduce the production efficiency and increase costs. The production quantities estimation should be part of the product brief and the design should be created accordingly. Don’t forget to consider the finance factors – customs, taxes, VAT, currency exchange rates, etc. You do not want any surprises in these areas. Create the MBOM (Manufacturing Bill Of Materials) as soon as possible in the design process. The MBOM includes the non-engineering aspects (suppliers, prices, quantities, etc.). The sooner you have the MBOM data, the bigger the chances to update the design according to commercial parameters. It doesn’t have to be a final or even accurate cost, but you must have a general idea of the product’s cost when you still have the option and the time to make design changes. I find it is quite common for product managers to compare between different quotes, but much less common for them to compare quotes to their calculations. It’s difficult to negotiate without knowing the cost details. Doing your own calculations will teach you a lot about the cost parameters and will give you a much stronger negotiation position. This will lead you to effective cost reduction opportunities. 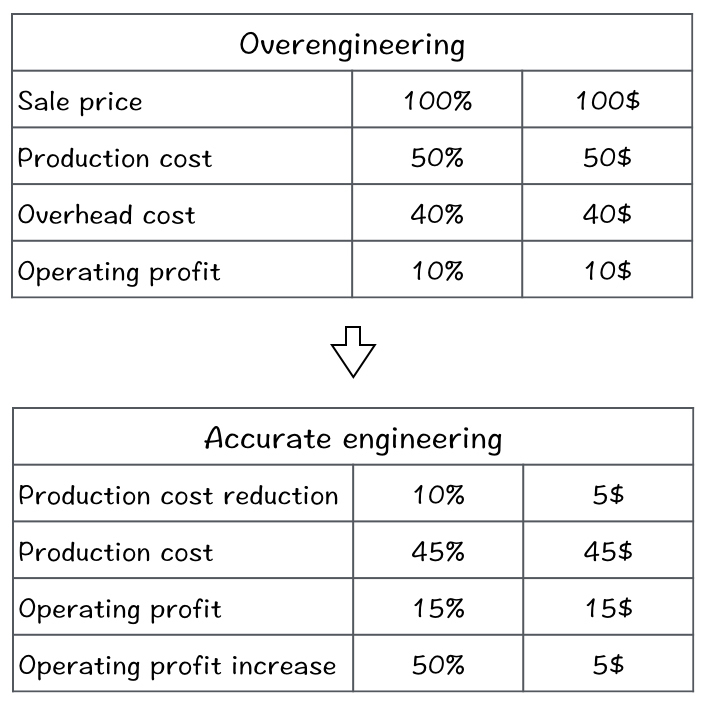 Reducing product costs requires work and time. Make sure to spend your cost-reduction work in the right places. Hidden costs might have a great impact on the product’s total cost, and they tend to be skipped in cost calculations during the design stage. Hidden costs are the product’s indirect costs, such as by products, shipment, logistics, customs, taxes, funding, etc. In many cases, short timetables cost (much) more than the same work done over a longer period. You have two options: one is paying in time, and the other is paying in dollars. Both are fine – make a decision. Just do not be tempted to take shortcuts and think that you can win them both. This entry was posted in Product Design Management and tagged BOM Management, Business, Product Design, Product Design Management, R&D by Yariv Sade. Bookmark the permalink. Yariv thanks for sharing. For me as I am not a designer all these viewpoints seem logical. And with PLM we love to manage and visualize them. How much is design to cost considered in companies do you estimate ? It’s very much depend on the industry. However in most cases time-to-market is more important than the product cost. “We will reduce costs later” is a common say (this is why they invented Cost Reduction Engineering). About a year ago I made a survey – I asked 150 product developers to estimate the cost could be reduced from their average product. The average answer was 30%. It’s crazy! as 30% in cost = ~150% in sales. I believe there is a lot to improve in the industry in regards to DTC. Thank you Rick. You might find http://productdesignmanagement.com/over-engineering/ interesting as well. Great post (came here from Oleg on Linked In). Can you offer some suggestions with applying this methodology within service or process solution design? Not all that is designed is tangible. Thank you Dimitrios. I’m working on a book dealing with all kind of these questions – how to implement product design management methodologies. Meanwhile, If you could be more specific with your question, I’ll be happy to try to helping.